I just couldn’t resist this photo from the 1997 BBC Hamish Macbeth series (Season 3) based on the mystery stories by M.C. Beaton. 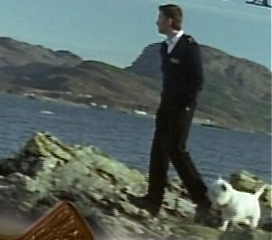 Here’s Robert Carlyle as Hamish on a cliff edge, being “hounded” by his faithful companion, Jock. If you like British “cozies” and stories of the wise-fool then you’ll love this series. And, if that’s not enough, in Beaton’s most recent Hamish Macbeth book, Death of a Gentle Lady, he’s referred to several times as a fool. Thanks Mary, I’ll have to check them out. All things I enjoy!